This stylish silver finished heart necklace pendant is a great accessory to any wardrobe. Not only are these cubic zirconia heart pendants very popular, but with a custom engraving you can be sure to wear something that is unique. These hearts have an elegant border with carefully placed cubic zirconia stones that will shine and glimmer. Choose between the small and medium sizes for what fits you best. 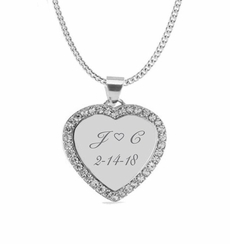 The heart can be engraved with a name, initials, short message or engrave the heart with you and your lover's names and special date. 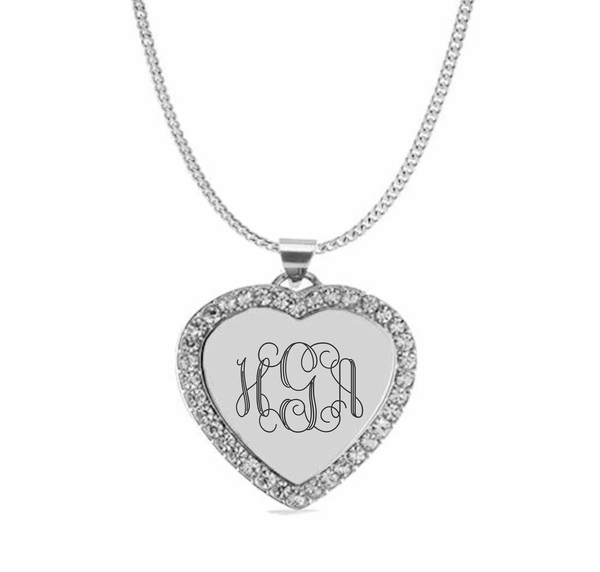 Each engraved heart includes a necklace[pictured] along with the pendant with custom sizes available.